Every summer, the Walmart parking lot in Whitehorse swells full of camper vans. Walmart has a long-standing tradition of welcoming campers overnight, without the fees and advance reservations required by most recreational vehicle (RV) parks. Since Whitehorse’s first Walmart opened in 2001, RV park owners have voiced concerns about lost revenue — a sentiment that many of Whitehorse’s independent businesses shared when the big-box giant opened. On a humid weekday afternoon in early July, the Walmart parking lot is a hub for RVs with names like Wilderness, Spirit and Eagle. A steady stream of vehicles, fresh off the road, are lined up at the gas pumps. Drivers are stretching their legs, walking the short distance into the Walmart to pick up whatever they’ve been missing on the road. The parking lot is full of personality, creating contrast with what has become a symbol of American consumerism. A converted school bus holds what looks like a homemade motorbike. Tony Lee and his wife, Betty Lee, just pulled into the parking lot. Their road trip started six weeks ago, near Dallas, Texas. They’re not planning to linger here long. “I guess there’s two sorts of motor homes. There’s ones like us who are travellers. We don’t sit anywhere for long periods of time,” says Tony, when asked why he and Betty chose to stay the night in the parking lot. A different sort of camper might stay in one place for months at a time, sometimes to escape cold winters back home. The Lees are from the small town of Bulahdelah in Australia. 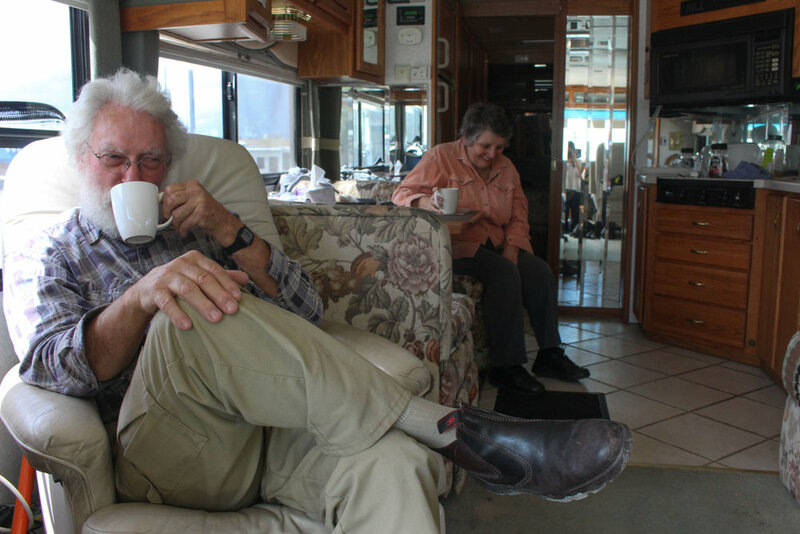 Twelve years ago, they bought a motor coach bus that they converted into a motorhome. After driving it around Australia a few times, they decided they wanted to go to Europe and possibly South America. Today, they own motorhomes in the United States, Germany and Australia. According to their shared business card, they’re “International Grey Nomads.” When they’re in the mood to travel, they just fly to wherever they last parked one of their motorhomes and start driving. That’s what Tony and Betty are doing now. They’ve been to the Yukon and through Alaska before, driving up the West Coast from California. They stayed at the Whitehorse Walmart that time, too. Betty and Tony say they saw more than half a dozen bears in the days leading up to their arrival in Whitehorse. They’ve seen grizzly bears, bison and bighorn sheep during their travels in the north. "We have kangaroos,” Tony says with a laugh. In a couple of days, the Lees will be back on the road. They plan to drive the Dempster Highway to Inuvik and on to Tuktoyaktuk, a stretch of road that didn’t exist the last time they were here. The Walmart parking lot is a place to rest along the way.